With this easy egg nog recipe, you can make up a batch of homemade egg nog in no time at all! 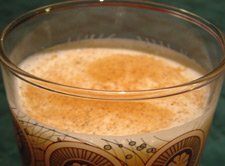 Egg nog is one of my favorite traditional Christmas treats, but until I found this recipe I had stopped drinking egg nog. The varities available at the store were just much too sweet for my taste. Now I can make a batch of egg nog whenever I like, and make it just as sweet as I like. Adjust the amount of honey to your own taste. You can enjoy this beverage just as is, or add a shot of rum for an alcoholic holiday drink. If you don't have a blender, just put the ingredients in a jar with a tight fitting lid and shake vigorously until the egg nog is frothy. This recipe makes one serving. It is easily multiplied, so you can make exactly as much as you want. Put the milk, egg and honey in the blender container. Blend until well mixed and frothy. Just before serving, sprinkle some nutmeg on the top of the egg nog. Return from egg nog recipe to recipes for Christmas.